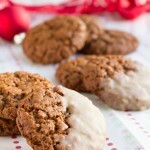 Melt-in-your-mouth ginger cookie recipe with a chewy texture. Dipped in homemade vegan white chocolate for a Santa-ready cookie. No milk dipping required! Combine the flax seed with the water and set aside. Add dry ingredients to a bowl and mix until incorporated. Set aside. In a separate larger bowl, combine wet ingredients until smooth. Add dry ingredients and mix with a spatula or use your stand mixer. Mix until combined. Line a two baking sheets or an Epicure Baking Sheet with parchment paper or an Epicure Bake & Roll. Using your tablespoon, divide dough into small balls, rolling between your hands and placing on the baking sheet. To scrape the remaining dough from the bottom of the bowl, I use my Epicure Easy Scrape. Once complete, transfer to the freezer to chill for 30 minutes. Preheat oven to 325F. 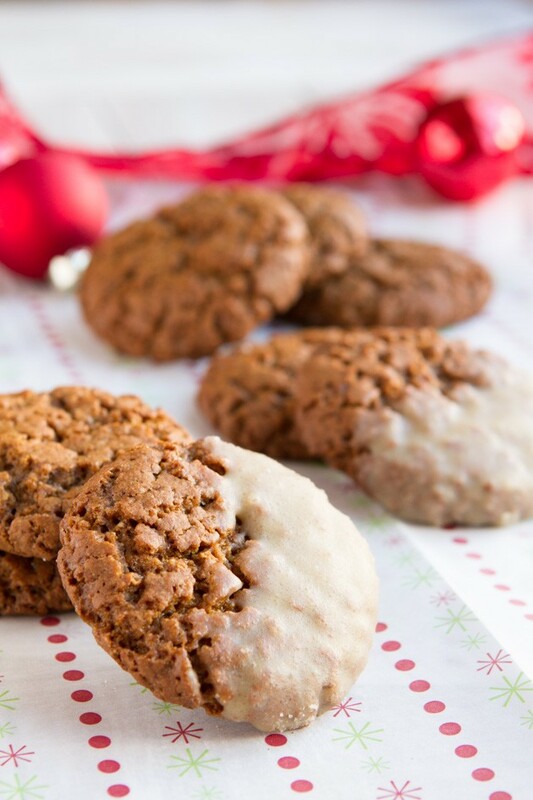 Once cookies have cooled, transfer directly to the preheated oven. Bake for 15-20 minutes, until cracked on the tops and lightly golden on the bottoms. Remove from the oven and allow cookies to cool for 1 hour. While the cookies are cooling, prepare the vegan white chocolate. It can sit out on the counter for 30-45 minutes to slightly harden (which will make frosting a lot easier). To prepare, add all ingredients and set aside. When cookies are ready, dip half of the cookie in the white chocolate and place on a cooling rack. Once all cookies are complete, transfer to the freezer for 15 minutes to harden up. You can skip this step, but it will take longer. Cacao Butter: is what gives the dip a white-chocolate flavor. Highly recommend keeping it in there. White Chocolate: if you want it white, omit the vanilla extract. Chilling: don’t skip this step. Nutrition Information: while much lower in carbs than a classic gingersnap, this recipe isn’t totally low-carb. I would enjoy these as a treat in a carb-up. Xylitol: if you don’t like xylitol, feel free to replace with a sugar of your choice.